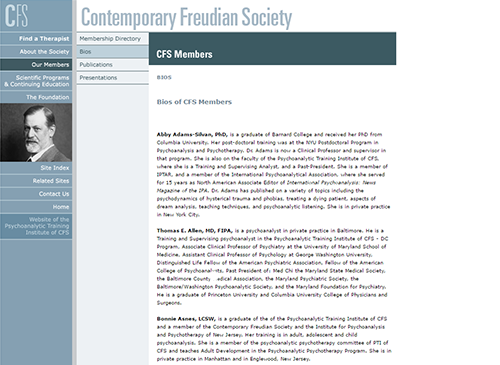 The Contemporary Freudian Society (CFS) had considerable history as a highly accredited psychoanalytic society. CFS members included leaders in their field. Plus, their Institute had a well-deserved reputation for providing rigorous professional training. However, in 2014 they realized they faced some complex and urgent marketing challenges. 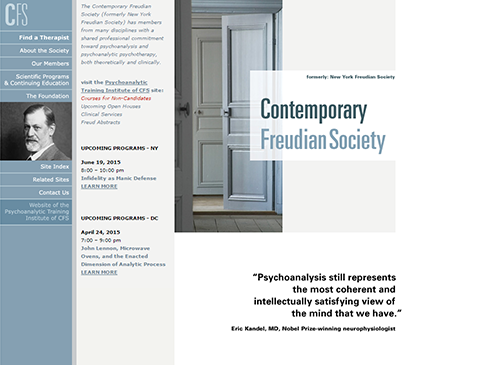 They shared the struggle that the whole field of psychoanalytic psychotherapy faced in communicating with the general public about the advantages of their approach to treatment. Furthermore, CFS was dealing with some unique complexities. First, they had two major centers of operation – the New York Metro area and Greater Washington DC. So they were grappling with how to best give equitable visibility to both places, as well as be inclusive of members in additional cities. Second, they wanted to better clarify the relationship between their professional society and their training Institute. Finally, although their Society and Institute websites had been thoughtfully designed several years earlier, both were hard coded in HTML. This made them unresponsive to mobile devices and expensive to maintain as platforms to publish new content. Public Voice NY worked with NY and DC area members and training candidates to achieve a complete nonprofit marketing reset. First, we honed in on the unique role of the Society as a professional community of practice. Second, we focused on the value of the Institute as a source of both training and support for launching graduates’ private practices. Third, in order to make the most of the strengths of CFS and its Institute it became clear that a new tagline had to be developed that was consistent with their new branding. Next, we focused on their need for a stronger social media presence and a new suite of print materials to distribute to those looking for a therapist / those who needed to make therapy referrals. Equally important, they needed new materials to give to those seeking training. Last but not least, to serve their goals, their websites would need several new areas of functionality – a searchable database of member therapists, the capacity to showcase content geared to both the general public and the analytic community, the ability to update course syllabi, class schedules, and other candidate resources, and an online calendar and registration for public and professional education events in both locales. A first-of-its-kind event form entry that can be mirrored from one WordPress site to another using the updates to the Formidable API plug-in developed in response to this client’s particular needs. Key CFS leaders were energized to make the Herculean effort to revamp / create anew all of their marketing assets. Both locales hammered out ways to share visibility and coordinate their web and social media content. They produced a greatly expanded and richer copy deck and undertook the training to be able to upload and manage it. As a result, CFS and its Training Institute are now able to offer all their audiences a rich set of communications assets and digital content, in clearly organized, accessible formats. Their investment will pay for itself in reduced hosting and maintenance costs, and will continue to serve them well into the future as they grow and develop. 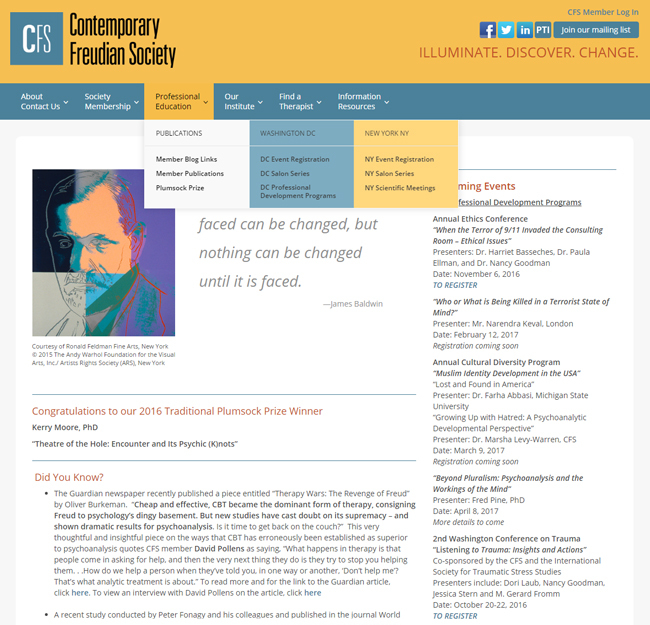 To see more, visit contemporaryfreudiansociety.org and www.instituteofcfs.org. 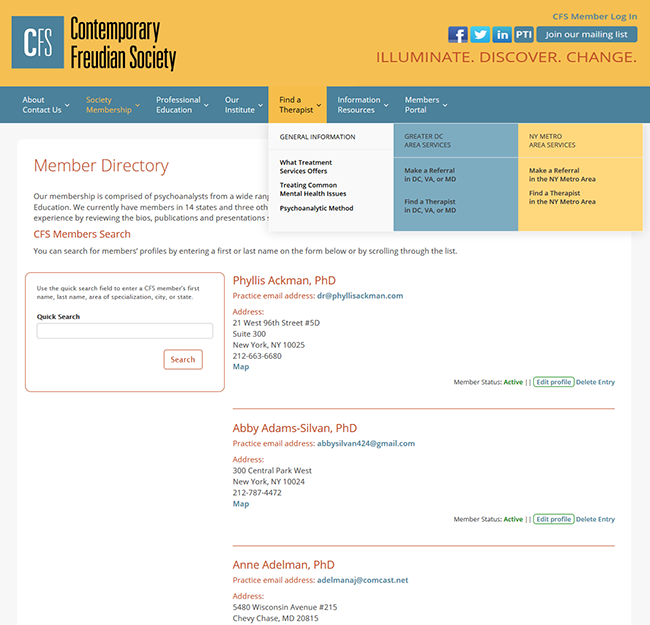 Or scroll down to see before and after screenshots of the Society website.